of results at sporting events. Competitors: Get complete results with split times and placings shortly after an event finishes. Teams can be provided with full results for both team and individual's performances. Split placings are provided so you can compare your performance lap by lap, or within disciplines in all multi sport events. 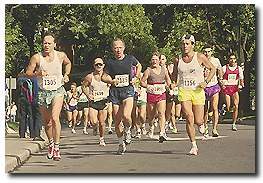 Time Keepers: Reduce the workload and stress involved in running events. Provide more information for each competitor's and team's performance. Use the stopwatch software and calculate final results within minutes of event cut off. removed for the full copy of the software. The results collation software is a WindowsXP to Windows10 application. 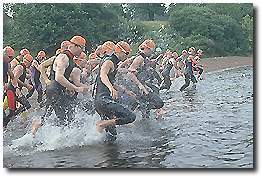 Each competitor/team must have one unique event ID (Number, Letter, or Combination). Only one time can be stored for each competitor/team per leg. SportCalc only accepts times, not points (times to one second accuracy). A missing time code can be inserted without affecting final results. SportCalc has been successfully tested in the following events: running races, duathlons, multi-sport events, relay races, mountain bike races, cycle stage races and triathlons. SportCalc is the helping hand all sports organisers in timed events have been waiting for! Sponsors not only require well planned events but also need a prompt, accurate and well organised prize giving ceremony. SportCalc can provide all this! Not only will it reduce the delays in providing competitors with results, it will also help relieve officials of the frustration involved with competitors eagerly awaiting their results, by giving them fast accurate information - with few or no manual calculations. Look what SportCalc can offer YOU ! An operator can keep track of up to 10,000 competitors in 50 events each with up to 2000 legs or laps and 50 categories over several days. Publish interim results at any time you choose. Publish final results immediately the minimum number of competitors you have specified finish in any required category. Full checking of result entry, collation and sorting of results. Printing of comprehensive results even whilst the event is still running. Results are available in preview or printed form, and published to RTF or HTML files. Interfaces are available to chip timing readers - Allflex, MyLaps, RfidTiming, Times-7. Sportcalc has now been superseded by other packages such as www.racetectiming.com. As a result I will continue to support existing users but will try to not take on new users. My main issue is with the time involved in supporting non-technical users with Windows problems. If you are based in New Zealand and are proficient on computers, then approach me for a free copy of the software. Just don't expect the phone to be answered immediately as I am retired and often away travelling.